CABOOLTURE, AUSTRALIA, Aug. 9, 2018 – Northern Light Technologies (NLT) and Matrix Design Group, LLC (Matrix) are pleased to announce that the Matrix IntelliZone proximity detection system has received IECEx approval from the Department of Industry’s Mine Safety Technology Centre in Thornton, NSW, Australia. Originally introduced to the North American coal mining market in 2009, IntelliZone is the leading proximity detection system in the U.S. and South Africa. IntelliZone’s advanced software positioning system provides precise location of personnel around mobile machinery, allowing it to perform successfully in even the most challenging applications and environments. NLT has partnered with Matrix to assemble, test, distribute, and service the IntelliZone System in Australia to the IS standard. NLT is pleased to announce a new partnership with Matrix Design Group, LLC to develop market leadership in mine networking through the distribution of NLT’s award-winning N-Connex platform. 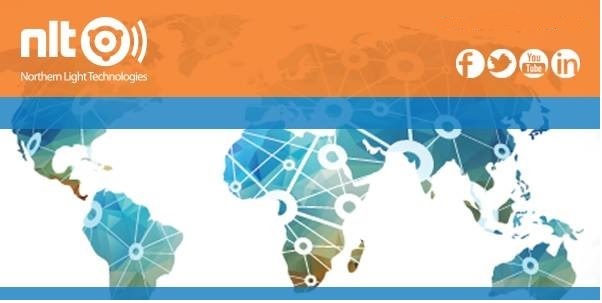 Matrix will collaborate with NLT to deliver solutions for communications, tracking, control and automation, and environmental monitoring into mines in the United States and Africa. NLT and N-Connex, Good Design® Award Winner in Product Design, will be featured in the Australia by Design Innovation (ABDI), a brand new Television Series on channel TEN. ABDI is an entertaining look at product innovations in many industries ranging from consumer products to heavy industry, and products will compete to be in the top ten. Join us over the next six weeks to explore the best innovations Australia has to offer. N-Connex was one of only 244 entries to receive the 2017 Good Design® Selection and is now in the running to receive the coveted Australian Good Design Award, which will be announced at the Good Design Awards Ceremony on June 8 at the Overseas Passenger Terminal (OPT) in Sydney. Toronto, ON – Northern Light Technologies (NLT) announced today that they have acquired the assets of ActiveControl Technology Inc’s mining division, namely ActiveMine, ActiveTracker, ActiveVoice and ActiveMesh. ActiveControl, located in Ontario, Canada, develops robust certified IS (Intrinsically Safe) network and wireless solutions for harsh and demanding mine environments, while offering redundancy, easy maintenance, and improved safety and productivity enhancements. With the newly acquired technology, NLT can now offer Gigabit Ethernet speeds, which allow for a multitude of Wi-Fi client devices to run on the network without compromising transmit speed or throughput. These nextgen access points offer the latest in 802.11n technology, providing higher bandwidth and more volume of data to be transferred. Applications requiring high speed, volume data, such as HD video, real-time monitoring, Vehicle Monitoring Systems, (VMS) and VoIP, are now confidently provided. The new model AM1000 nodes can be configured with up to four radios to allow for increased coverage areas underground and for communication along multiple roadways from a single access point. Ultimately, this will result in cost savings to the mines. NLT offers the latest in personnel and asset tracking, real-time environmental monitoring, and can facilitate automation at many levels. Remote measurement and monitoring, and full communications solutions have been provided to both mining and tunnel construction, and our clients include coal, hard-rock and other mining, both underground and surface. 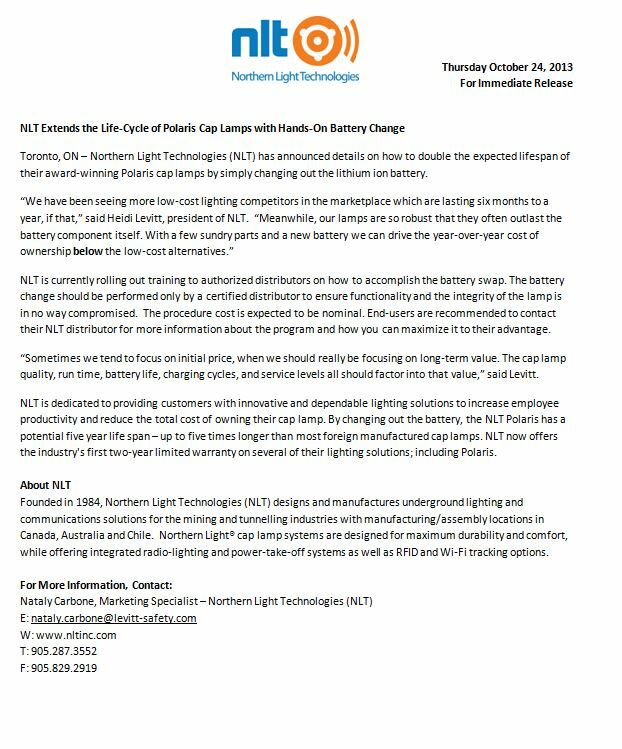 Founded in 1984, Northern Light Technologies (NLT) designs and manufactures underground lighting and networking solutions for the mining and tunnelling industries with manufacturing/assembly locations in Canada, Australia and Chile. 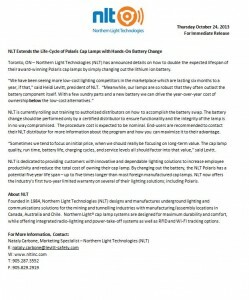 Northern Light® cap lamp systems are designed for maximum light output, durability and comfort, while offering secondary power options for RFID and Wi-Fi tags, and for remote controls. The NLT Mining Networks division is a turn-key partner in the design, manufacture, deployment, and support of scalable communication technologies that change the way mines communicate, collaborate, and operate. You’re Invited to a Lunch & Learn with Northern Light Technologies….